Please enter a valid email address and a download link for the document will be sent to that email address. When downloading the eBook select the SAVE option. Your information will not be released or sold. You must have a valid credit card to complete the process or you can use PayPal. There is a $1.00 transaction fee for processing. Transactions on the site are protected with up to 256-bit Secure Sockets Layer encryption so your credit card information is secure. 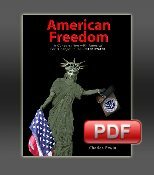 Copyright © 2008-2019 American Freedom Books. All rights reserved.